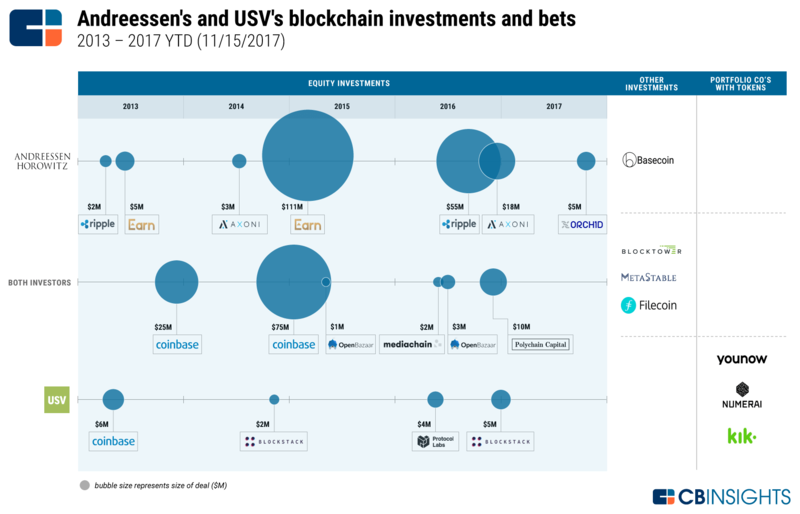 Climateer Investing: "Here’s How Andreessen Horowitz & Union Square Ventures Are Betting On Blockchain"
"Here’s How Andreessen Horowitz & Union Square Ventures Are Betting On Blockchain"
This year’s blockchain craze has pushed a huge amount of new money into cryptocurrencies, private blockchain projects, and companies holding initial coin offerings (ICOs). As of now, the total market capitalization of cryptocurrencies stands at more than $340B — a huge leap from where it started the year at $18B. Two of the top early-stage tech VCs, Andreessen Horowitz and Union Square Ventures, have placed bets on blockchain technology since 2013. Below, we show how their approaches to the sector have evolved, from traditional equity investments to investments into ICOs and cryptocurrency hedge funds. USV initially focused on bitcoin, making its first bet in early 2013 on popular cryptocurrency exchange Coinbase. Since then, USV has expanded its strategy to bet on more novel blockchain use cases: OpenBazaar is a blockchain-based, decentralized e-commerce platform, while Filecoin is a tokenized file storage protocol. Filecoin raised upwards of $200M in its ICO held earlier this year. Andreessen Horowitz’s early investments highlighted an interest in both bitcoin (Earn, Coinbase) and private blockchains for financial services (Axoni, Ripple).